Charismatic 20-year-old Saul “Canelo” Alavarez defends his WBC super welterweight crown against European veteran Ryan Rhodes June 18 at the majestic Arena VFG in his hometown of Guadalajara, Jalisco , Mexico. Alvarez (36-0-1, 26 KOs ) won the vacant title last March by battering Matthew Hatton from pillar to post. The fight was something of a mismatch. Haton had moved up in weight to challenge Alvarez, but it was obvious from the opening bell that the youngster was the stronger fighter. 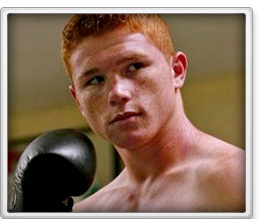 The only disappointment for the pro Alvarez crowd was that Alvarez couldn’t stop Hatton. Rhodes (45-4, 31 KOs ) is the reigning European super welterweight titleholder who has not lost a battle in five years. The 34-year-old “Spice Boy” will be fighting in the United States for the first time in his career. Alvarez won 11 of the 12 rounds against Hatton, and likely 12 out of 12 against his previous opponent, Lovemore N’dou. Prior to the N’dou fight, he dismantled Carlos Baldomir, knocking the former welterweight champion out in six rounds. With a skill set beyond that of most 20-year old fighters, Alvarez is proving himself as one of the most exciting boxers to hit the scene in quite some time. Blessed with fast hands and an above average defense, Alvarez is not immune to taking some risks and trading shots. Rhodes record is impressive, though he hasn’t fought anybody of note. His last fight was in December of last year when he knocked out one Rocky Junior in two rounds. Rhodes likes to switch from a southpaw stance, to an orthodox one, and utilize his jab. His key will be to keep Alvarez off him, and to stay out of the way of the young champion’s counter punches. For his part, Alvarez is very aware of his opponent’s propensity to switch. "I have to be careful when he switches hands. He's very strong," he said recently. Alvarez is a versatile fighter who adepts well to his opponent’s particular style. Rhodes likes to use his experience and move around the ring. Alvarez packs more power and has faster hands then Rhodes , though the old veteran can still sting. Rhodes has lost only four fights, but two of them were by knockout. Is his chin suspect? Alvarez has never been down in his young career. Rhodes recently stated that he’s uncovered some flaws in Alvarez’s style. "He makes a lot of mistakes, he's very erratic and he throws bombs," Rhodes replied. Maybe, but can he exploit Alvarez’s flaws? Rhodes defense has looked shaky recently. The fight could be over quickly if one of those bombs land. He needs to box and make Alvarez respect him. The first few rounds should be lively and competitive. As the bout progresses however, Alvarez’s heavier blows will start to wear Rhodes down, forcing the veteran to start taking more chances. Alvarez will catch and pound Rhodes , finally stopping him in round ten or eleven.